a few years ago on a beach in the DR my wife and I stumbled into a dinner spot on our last day and had one of those meals you never forget. Somwhow despite multiple google searches we just now unearthed the restaurants recipie that was shared with a travel blogger ten years ago. While GLS holds a special spot in my heart, I’d run away with Papi and never look back forced to eat just one for the rest of my days. Wash those lucky crustaceans. Melt the butter in a wide pan. Toss in the shallots and sweat em up. Throw in the curry powder and cook until you’re in a delicious fragrant cloud ~ 1 minute. Toss in the shrimps and cook a minute or so on each side until they are pink. Splash in the Pernod and stand back. Now tilt the pan forward until the liquid is at the edge and carefully touch the juice to the flame – WHOOSH! – there will be a giant flame that leaps up and hopefully doesn’t catch your bangs on fire ala the Michael Jackson Pepsi commercial debacle. You are now Flambéing – congratulations! You have always dreamed of this moment and now it’s here. You feel so French right now. Add the cream and bring to a simmer. Now sprinkle in a little salt and pepper and take off of the heat. 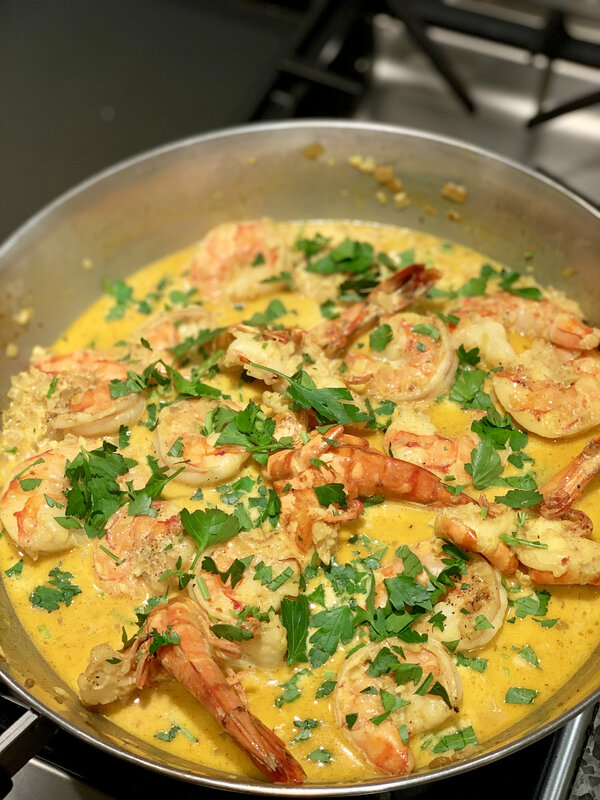 Pose the shrimps seductively in the pan or on a platter, sprinkle some chopped parsley on top for color and serve immediately with a crusty baguette, or whatever excuse for bread that your local bakery tries to sell you that isn’t a baguette. Devour the shrimp with your hands and sop up the sauce with the bread. People will look at you oddly because of the multitude of yummy sounds that you are making. Your fingers will smell of curry and Pernod for hours. Try not to eat them. Man that looks excellent. Thank you for sharing. GLS= Green Lightning Shrimp. Took me a minute. 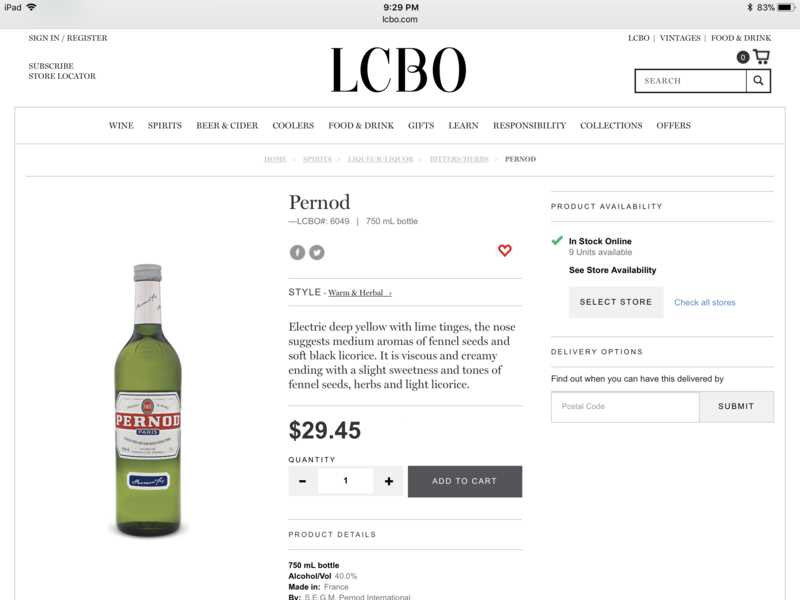 I had to look up Pernod. Are you using the Absinthe or the other Anise? That looks phenomenal! Love anything with curry it seems. ... I had to look up Pernod. Are you using the Absinthe or the other Anise? First, THANKS for the recipe -- it looks great! But second, no, the bottle in your picture is Pernod, NOT Pernod Absinthe. Those are two different things. Pernod Absinthe has wormwood in it (Artemisia absinthium), but "regular" Pernod does not. It's the wormwood that makes it absinthe. 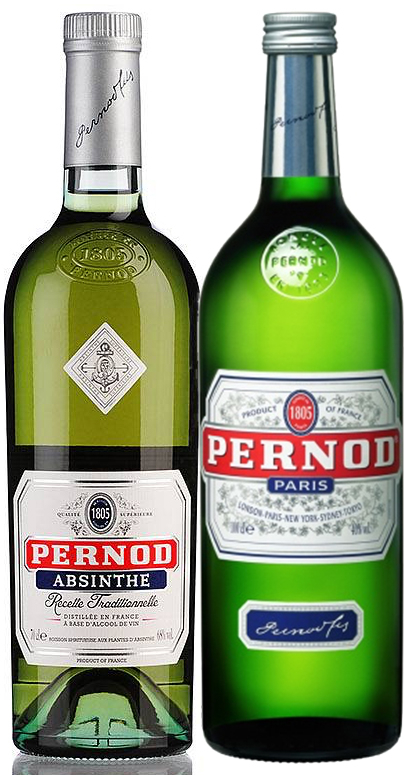 The Pernod company was one of the original famous makers of absinthe, but when absinthe was made illegal, they started making a non-absinthe version, which is what has been sold as "Pernod" ever since. Recently absinthe became legal again, so now they make both. The absinthe is much more expensive and has a darker flavor that's really delicious. I don't know whether it would be delicious in the shrimp dish or not, though. They are similar, but NOT the same. Very welcome! I've always found forbidden fruit desirable, I'm afraid, so when absinthe was illegal, I was dying to know what it tasted like. I used to love (regular) Pernod, but wondered what the "real thing" tasted like. Similarly, because decaf coffee tastes so very different than "real" coffee, it's made me wonder what Coca Cola tasted like before they had to take the cocaine out of it <gasp>. When absinthe finally became legal, I had to try it, of course, and it's very similar to Pernod (though different absinthes are different from each other), lots of anise flavor on top, but underneath the anise is a darkness I don't know how to describe, and it's really interesting and very good. I like it a lot. I don't drink it often, but I like it.